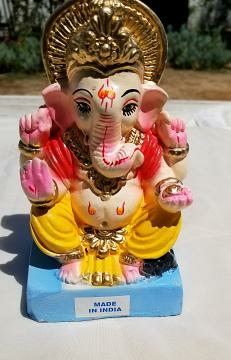 Celebrate Ganesh Chaturthi with this small ganpati bappa murti for visarjan. This item in Religious Figurine & Sculptures category was first added to our catalog on 08-22-2017. Buy Sree Ganesh Ganpati Clay Murti for Immersion Visarjan 6" , sold & shipped by Fabulous India where you can shop online for Natural Holi Color Powder, Hair Oil, Henna Powder, Indigo & Vitamins. This Visarjan Murti collection has been tagged as Ganesh Chaturthi Visharjan, Eco Friendly Ganpati, Festival, Puja, Immersion, Visarjan, Ganapati Dissolving Statues. While ordering , the option box shows "only statue (-11)" . what is this option? We have larger statues for immersion, please let us know if you are interested. Can you ship the item by Tuesday, Sept 11 next week? Also is this eco-friendly dissolvable in water Ganesh Idol? The shipping time will depend on where you are located. It takes generally 3 to 4 business days to deliver. Yes this murti will dissolve in water.